The better our relationship with God is, the more readily we’ll follow His instructions and example of goodness. We don’t have to already be good for God to want us. We will, however, keep becoming better people the more we let Him work in us. One of the reasons God chooses to work with us is so we can do good works. It’s not about us having to do something to earn God’s favor — good works are just something we’ll do naturally the more we become like God. We’re to follow Jesus, and since active goodness poured out of Him that’s how we’re supposed to be as well. 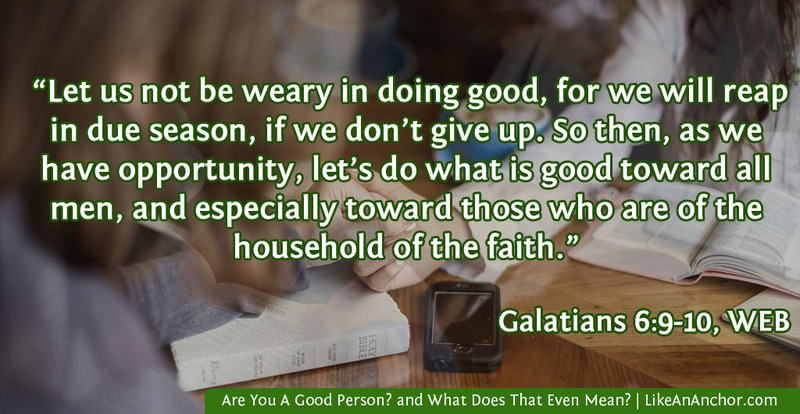 We must never give up doing good to all people, and especially to those in the church (Gal. 6:9-10, WEB). Another reason God wants to see us doing good is because goodness on the outside is an indication of goodness on the inside. He is inviting us to become part of His family, and as His children our hearts need to change and become like His heart. The “fruit” that people bear can tell us whether or not they are trustworthy, and the fruit we bear tells God the same thing. I find it interesting that in both Matthew’s and Luke’s account, Jesus follows the passage about fruits by saying we need to actually do the things He tells us to if we’re going to call Him “Lord” (Matt. 7:15-21; Luke 6:43-46). Genuine devotion to Jesus will result in good fruit because we’ll abide in Him, love Him, and Keep His commandments (John 15:1-10). It’s a hard thing to wrap our minds around that we cannot earn salvation by doing good things, and yet without doing good we won’t be saved. When our Master returns to “settle accounts with us,” He wants to find that we’ve used His precious, freely-given gifts to follow His example and commandments. If not, then we won’t be in His kingdom (Matt. 25:19-30). God searches our minds and tests our hearts to reward each person “according to the fruit of his doings” (Jer. 17:10). He’s looking to see whether or not we’re imitating Him and developing His character. He’s never going to give up on us, but He also won’t stop us if we reject Him and choose to walk away from His goodness. The instruction to do and be good is not meant to discourage us. God’s commands are neither too hard for us to follow nor out of reach (Deut. 30:11; Matt. 11:28-30). If we think that following God seems impossible, then we’re probably over-complicating things and/or not trusting Him to lead us. Doing “the good and well-pleasing, and perfect will of God” is simply part of our “reasonable service” (Rom. 12:1-2). Bearing good fruit isn’t a burden — it’s what happens when we’re filled with God’s spirit. That’s not to say following God is easy. It requires hard work and commitment, but even more than that it requires submission, trust, and faith. 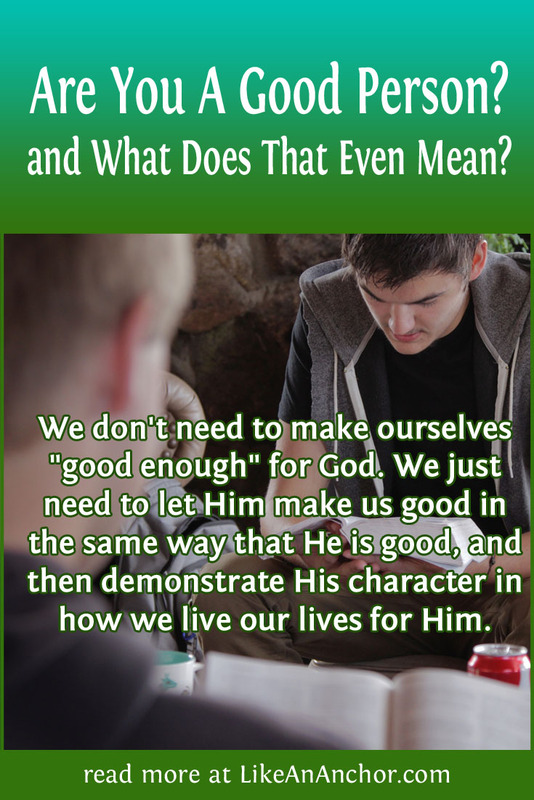 We don’t need to make ourselves “good enough” for God. We just need to let Him make us good in the way that He is good, and then demonstrate His character in how we live our lives for Him. Even Jesus didn’t claim to be good while He walked on this earth, so we certainly can’t either (Matt. 19:17). But if we’re striving to become better people by following God’s lead and abiding in Jesus, then we will develop the spiritual fruit of goodness. ← What Do You Want Your Inner World To Look Like? I don’t think I knew Jesus said that. How interesting. I wonder how that ties into the Trinity though. I also meant to add that I thought this was really well written and thought provocative. It does kind of seem like an odd comment for Him to make, doesn’t it? Why wouldn’t He want us to call Him “good” since God is good and Jesus is part of God? I wonder if it was because He was living as a human at the time and He wanted to caution against putting human goodness on the same level as God’s goodness? but I’m not sure. Thanks 🙂 I’m glad you found this post thought-provoking!